Hell is too boring, so The Devil transforms himself into... a monster apartment slum lord! Unholy Heights combines Tower Defense and Apartment Management to create uniquely fun and addictive game play. As The Devil, you have two ambitions: collect millions in rent and breed a monstrous legion of fearsome beasts! Unleash your monsters on the human adventurers and evict them WITH EXTREME PREJUDICE! Take the most fun parts of a Tower Defense button-masher and blend them with the best features of an Apartment Management sim and what do you get? 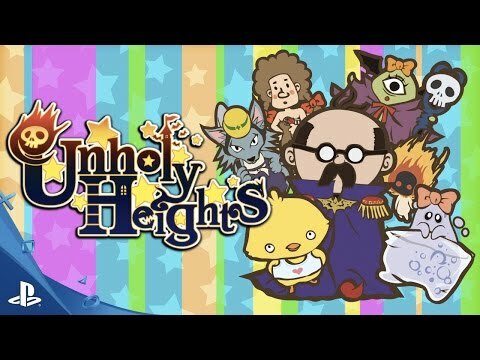 Unholy Heights for PlayStation 4! Your building begins small but there's room for unlimited growth if you manage your monsters right. Attract new tenants, watch them go to work, fall in love and even have children. Keep them happy with the right mix of furnishings and upgrades and they'll slaughter every troublesome human in sight! Battles are a thrilling blend of strategy and tactics: rouse your monsters with a knock on their door, summon them to battle, outnumber and trap invading humans in pincer formations, and collect the spoils of victory! As your triumphs mount and your tenants proliferate, gain gold and prizes to expand and upgrade your building and reward your most loyal and bloodthirsty monsters. Rule your building then RULE THE WORLD! Monsters will visit your apartment complex and decide if they want to move in. They live normal lives: they go to work, fall in love, and even have children. They also pay rent, which is one form of generating currency in the game, which you can use to upgrade the number of available rooms in your complex, buy furniture and commodities for your tenants. However, monsters can also be lazy, stay unemployed and get behind on rent, so you might be forced to kick them out to make room for more responsible monsters. Monsters are also vicious creatures from the abyss. As such, nearby human settlements aren’t exactly too thrilled with your establishment. They will occasionally send adventurers and heroes to your complex to try to kill you and your monster friends. You have to figure out what the best strategy for your gameplay style is. However, be careful: your tenants can die, and if that happens, they aren’t around to pay rent. Also, their lover won’t be happy if their one true love dies brutally by your hand. Furthermore, a tenant can’t fight when it’s out working, so be sure to time your battles wisely. © petit depotto. Developed by mebius. Registered trademark of Active Gaming Media Inc. Published by Teyon.